A Coin Operated Industry & Commercial Quality Pinball Dolly. PINBALL MEDIC makes what might be the easiest to use and store pinball dolly in the galaxy. Our inventory (with dolly enhancement options) will be listed here as soon as they are manufactured and tested. Our pinball dolly makes loading a machine into a truck a one person job! Due to new apartments being built on top of our old shop space, we do not have the ability to make this pinball dolly. We are currently looking for a space in Austin and in surrounding towns. Looking for manufacturing space and designing a new dolly wheel means we will not be building dollies. Shipping and handling, Texas sales tax and dolly equipment options cost extra. Some simple assembly is required. All dollies are shipped from Austin, Texas. Stock 4 inch Wheels - No protective wood on top of dolly. Two control handles. Two front non-swivel wheels, two swivel rear wheels. 4 ton hydraulic system - stock fixed minimum height (not adjustable). Top Railing Protective Hard Wood. 3 or 5 inch with sold rubber rimed metal hub wheels All wheels are now bolted to the main dolly frame. Wheels and wheel size can be changed and whole wheel assemblies replaced. If a completed dolly has not been paid for in full for any reason, it will appear as inventory on this dolly page. We will also make an inventory of dollies with various equipment enhancements already installed. Anyone can purchase a dolly from inventory using the dolly's serial number. A one handle dolly that both lowers and raises using the same control handle. Mechanical lifted dolly (Hand or powered screw lifting mechanism). Guaranteed to never leak hydraulic fluid! It never needs any to operate. An erector set styled (U put it together) ultra portable, lite weight but sturdy (all mechanically lifted) pinball dolly. (3-22-14) The following paragraph has been temporally deleted. We will start to take new Dolly orders again after we find and outfit a new shop space. Dolly orders are accepted at any time, however, payment will not be required until the dolly has been completed. Finished dollies should start to appear on this page in the first quarter of 2013. They will be built with various dolly options and be listed as soon as they are built and tested. All dollies will now be shipped as kits with some simple assembly required. Local sells can be picked up in Austin, Texas. Only simple hand tools are required to assemble this pin dolly. This reduces our shipping costs and construction labor. Fully assembled dollies can still be picked up in person at our brick and mortar repair shop in Austin, Texas. We are changing the way our dollies are built to accomplish additional add-ons and options on our basic dolly's main frame. Most of these changes/upgrades will still fit on the basic Yellow Jacket frame and lifting mechanisms we've used for many years. Don't be fooled into thinking a cheaper product or a lifting table (Lifting tables are not designed to move a pinball machine.) will be just as good as a Yellow Jacket pinball machine transporter dolly. No other dolly on the market today comes with custom built detachable control handles or has a bigger wheel then even our stock dolly frame wheel size (4 inch). We tried just about every other kind of dolly/lift on the market today and didn't feel too impressed. The fact most other pinball moving equipment use the operator's weight and mechanical advantage to raise a pinball machine is archaic at best (instead of letting hydraulics do all the work). The ease of use our real pinball game dolly provides is why Pinball Medic designed and builds the Yellow Jacket dolly. Read some facts about the differences between a pinball dolly, a lifter and a lifting table. We strive to improve the design and add dolly options every time we make a batch of these easy to use, well designed and hand made in the U.S.A. dollies. Pricing depends on the number of "like" dollies ordered. The hydraulic Yellow Jacket pinball dolly offers superior performance over the classic outdated gurney style pinball lifts costing $480.00 or more. Optional Dolly Equipment, Dolly Enhancements and Replacement Parts sections have been added to provide additional functionality and construction customizing to our state of the art pinball dolly. Fact: Most damage to side art, score board or playfield glass, coin door and other hard to repair or replace game parts is caused by the moving of the pinball game. Remedy: A custom built dolly designed to move nothing but a pinball can limit the possibility for game damage and makes moving a 350 pound or more game quick and painless. To further reduce shipping, manufacturing costs and dolly weight - Four inch wheels are now the stock wheel size. Pinball Medic is the only manufacturer and dealer of this unique pinball trolley and yes, we do use the YJ dolly on a daily basis (We went with the five inch wheel size.). We know it's a keeper because for over eight years our shop dolly has taken some extreme abuse (falling off a truck dock, etc.) and has kept on working. The only difference between the Yellow Jacket warehouse dolly we use and the one we ship to customers is ours "glows in the dark" so we don't trip over it in the shop or warehouse (We'll add a photo soon). We will begin the process of adding additional upgrades and customizing to this dolly as time permits. We are considering discontinuing the top wood option in favor of powder coating the top rail sections to reduce the overall weight of the dolly. This would eliminate the possibility of water damage to the protective top hard wood. Also, changing the default shipping method to a two box method dolly kit would save some on the shipping and only require minor dolly assembly. Due to the limited source of building materials, the expense and the amount of labor involved in making these dollies, we are currently not looking for dealerships. Although this may change in the future. Note: Woodrail pinball machines were not checked for clearance. We can offer shipping to most destinations in the continental U.S.A., but can not ship overseas or out of country. Using hydraulic lift, the Yellow Jacket pinball dolly stops the arcane practice of using the operator's weight to lift the pinball machine. This makes it possible to lift and move even the heaviest of electromechanical pinball machines weighing in excess of 400 pounds. Hydraulics allow for very smooth and gentle lifting and lowering. High hydraulic dolly lift height of up to 31 inches (variable dolly lift height - measured from ground level to bottom of pinball) with optional 5 inch or the front Curb Climbing sized wheels allows for effortless and stable loading of a pinball onto a medium sized pickup truck. No more lifting the pinball off the dolly; just roll the Yellow Jacket pinball mover up to the back of the truck and slide it on. The Yellow Jacket's lift mechanism and center of gravity are located near the base of the dolly. This produces a low center of gravity for a very stable dolly operation - in spite of the dolly's compact footprint. In contrast, the gurney style of dolly has its lifting mechanism located at the top of the dolly's platform making it less steady (top heavy) and not self leveling. Dolly can be used as a pinball repair table. This dolly can provide a height adjustable platform for doing pinball game or playfield repair. Totally lowering the dolly insures the pinball will not slide off of the dolly. A fully lowered pinball with its legs removed can be safely and easily rolled around a repair shop or game room. The basic Yellow Jacket frame uses the standard industrial pinball dolly width, large wheels and a low center of gravity - insuring tilt free operation. Total Dolly Load Weight Capacity = 1000 pounds. (using 4 or optional 5 inch wheels). This dolly can easily support the heaviest of four player electromechanical pinball games weighing in excess of 400 pounds. The standard dolly width insures the dolly will roll between the front legs of a pinball for easy dolly positioning. However, with the Curb Climbing front wheel option, the dolly may have to be rolled under the game between the front and back legs on one side of the pinball cabinet. Removable Lift and Lower Control Handles - The lifting handle only protrudes from the coin door end of the pinball approximately five inches and does not interfere with the dolly operator's legs. This feature eliminates the "shin bruising" caused by the stepped on lifting bar used on other dollies and increases the Yellow Jacket dolly's ease of use. ALL control handles can be removed and reapplied during dollied game transportation to avoid any unwanted handle to operator interaction. In development is a one removable handle dolly. One handle is used to both raise and lower the dolly. Built using LARGE 4 inch solid metal roller bearing hub and lined rubber tire wheels (4 inch wheel on left side or the optional 5 inch wheel on the right side of photo). All wheel options use solid airless hard rubber lined tires for easy, scratch free movement including over hardwood floors and thick carpet. Tire air is never required with any size wheel we provide for this dolly. Dolly Wheel Options: This dolly is made with stock four inch wheels. Optional 5 and even huge front end mounted 8 inch Curb Climbing wheels can be installed. Optional wheel sizes provide the largest rubber lined wheels available on a retail marketed pinball dolly. Upper rail assembly anti sway bars have been added to decrease front to back game motion when moving a pinball and to further steady the dolly. This helps to insure a heavily loaded dolly will not sway when the game is pushed by the operator. The bolted on sway bar assemblies provides both a clean look and easier dolly use. The very tight turning radius, small footprint and large wheel size of the Yellow Jacket pinball dolly provides for a faster and easier job when positioning a game or rolling a dolled pinball onto a lift gate; compared to the old design and longer "gurney" styled dolly. This saves valuable time when loading a large number of games onto a box truck, especially if the truck uses a small width "hide-away" lift gate. The dolly's sturdy metal frame allows for easy tie-down use with no need to adjust the tie-downs when raising or lowering the pinball machine on the dolly. Tie-downs help to make the moving of games up/down steep and rough inclines quick and easy. Note: Ratcheting Tie-Downs can be purchased at most building supply houses or hardware stores and are NOT included with the dolly. Padding must be provided between a folded down backbox and the playfield glass guides or crimping might result when the pinball machine is dollied or when straps are used. The tie-down's metal mechanism must also be padded to protect the game's side-art. Cardboard will work fine for this padding. Removable and Extendable Raise & Release control handles for ease of operation and easy dolly storage under a pinball. Hydraulics allow a pinball to be lowered or raised in stages. In contrast, the 'gurney' styled dollies only allow for fully raise or lowered dolly operation. Staged Lifting and Lowering increases the Yellow Jacket dolly's operational safety as surrounding obstacles and dolly roll potential can be judged during the pinball dolly's lift & lowering operations. Any pathway impediments can be rectified prior to damaging any dollied pinball game, expensive coin-op arcade equipment nearby or overhead fans. Strapping anchors are permitly welded to each top rail allowing the full lifting/lowering movement to occur without the need to tighten or loosen the straps that hold the machine to the dolly. The Yellow Jacket uses Hydraulics to lift the pinball game. Other commercial pinball dollies use the dolly operator's body weight and/or arm strength and mechanical advantage to lift the pinball game. On the old 'gurney' style of dolly the dolly operator stood on a lifting bar. The operator had to be 'calorically gifted' to provide enough weight to lift the pinball, be able to stand on one leg and push down on the lifting bar - all at the same time. 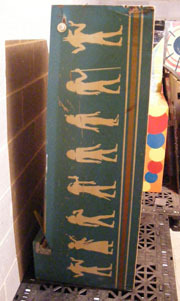 The obsolete lifting bar usually interferes with the dolly operator's legs while walking and can do damage to the front pinball legs. The 'Large Operator Requirement' of other coin operated game dollies and the lifting bar have all been eliminated on the Yellow Jacket pinball dolly. Using Hydraulic lifting, this dolly is completely 'gender neutral' and can be used effectively and safely by both men and women. Industrial High Quality hand or foot pumped and released Hydraulic system insures years of trouble free operation. Without further need to lift and move heavy coin-op equipment by hand, this dolly will greatly reduce back Injuries and damage to coin-op equipment. Wheel sizes can be special ordered from 3, 4 (stock size), 5 inch main frame wheels and huge 8 inch diameter (front wheels only) curb climbing wheels. Four and five inch wheels provide the SAME total dolly load weight capacity. Five inch optional wheels provide higher clearance, slightly easier wheel roll over on thick carpet and an one inch increase in Total Dolly Lift Height. See Dolly Options Wheel and Dolly Specs Chart and Custom Ordered Wheel Chart at the bottom of this page to determine a dolly's Maximum Load Weight Capacity, shipping weight and Total Lift Height by wheel size. Low minimum dolly height of 17 3/4 inches (18 3/4 with optional 5 inch and 19 1/4 inches minimum height with 8 inch wheels - even lower when 3 inch wheels are used). This pinball transporter will fit under almost any pinball machine including under old and new style pinball games with short length front legs. Dollies equipped with Curb Climbing front wheels and tasked to lift old wood rail, flipperless or some other rare type of pinball game may need to be rolled between the front and back legs on one side of the game instead of between the two front legs. Note: Old System 1 Gottlieb wide-body pinball games use short length front game legs - The Safe Cracker pinball has unusually short legs but can still be dollied by the Yellow Jacket. Unique dolly design helps hold the pinball from sliding off the dolly when the dolly is fully lowered (game's legs removed). This mechanism is automatically released when the game is raised to facilitate loading a pinball onto a truck or when sliding the pinball game off the dolly and onto the machine's back for storage. The inherent "Self Leveling" design of the dolly's Quad Lifting Arms insures the lifted pinball machine rides flat on the dolly even down steep inclines and uneven terrain - with the backbox installed, folded down on the play field or removed. Even when the Curb Climbing wheels cause the main frame to be higher in the back then the front, the top rails and pinball game remain flat and level. A small, compact footprint allows the transportation of both the pinball dolly and multiple pinball machines in the same medium sized truck with room to spare. Also for easy dolly storage under an operating pinball. The Small footprint and dolly transporting ease of this pinball dolly helps commercial arcade sites, shop operators, coin-op route and home game room owners without large and expensive box trucks or limited storage space. You can't get this space saving feature (without sacrificing stability) with any other pinball dolly. Solid hardwood slide rails on the top of dolly will not scratch the bottom of a game. Allow for easy operator removal of a pinball off the dolly for both truck Loading / Unloading and for placing a pinball on its back for storage. For an even easier time loading and unloading a pinball that has been stored in its upright position, see our new Tilting Top dolly customizing option at the bottom of this page. Constructed with square tubing lifting arms and a strong metal C-Channel main frame. Welded using 70,000 PSI welding material for solid weld construction and superior strength / durability. Built to take years of hard use. A true pinball dolly like the Yellow Jacket is used to both lift a machine off the ground to facilitate leg removal and functions as a transporter for moving a pinball machine. It's designed to only move game type specific pinball machines and nothing else. The Yellow Jacket uses an airless scratch free rubber lined tire over a large metal wheel hub. In the long run, there is nothing saved by buying a cheap lifting table to move pinball machines. The damage to side art and game cabinet wood from using a table outweighs any benefit from an initially cheaper purchase price. Lifting tables are simply not designed to move a pinball. 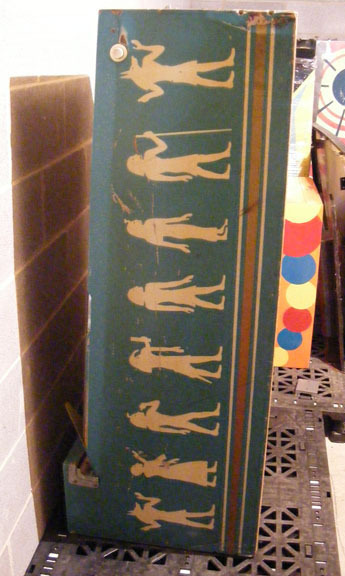 The 'gurney' style of dolly (second photo on the left) uses the operators weight to lift the pinball and usually can't be put on the same pick-up truck as the game because it's too long and takes up too much bed space. It often leaks hydraulic fluid from the set-down speed reducer shock mounted in the middle of the dolly. A pinball lifter (not shown) is typically used to lift the game for leg removal only. Some expensive lifter models allow for limited movement of the game, normally use very small wheels and the lifter can get in the way of the operator or be hard to store. There are lifters on the market now that don't go under enough of the game to support outside use, game transportation down a hill or over rough terrain. The pinball simply hangs too far over the back end of the lift and there isn't enough dolly supporting the machine. They are therefore potentially front heavy and unstable (This potentially serious issue is even stated in an on site video for one such product.). Use of tie downs to hold the game on the lifter is mandatory with normal pinball lifter use. A lifter table (third photo) is not made to fit under a pinball because they are designed to lift car engines and not pinball machines. They are so wide they have to be used on the side of the machine. It can scratch the side art and damage the bottom wooden edge of the cabinet. More information on this false pin dolly is in the next few paragraphs. In comparison to all other forms of pinball transporter, the Yellow Jacket dolly was designed to lift and move nothing but pinball machines. It has always used large sized airless scratch free wheels, an automatically activated mechanical brake to keep a fully lowered game from sliding off the dolly and the combination of a low center of gravity and small footprint for easy of storage and stability. A cheaply manufactured lifting table has to be modified to use. Usually the stock handle has to be removed and a new owner made custom handle has to be installed. They can only be placed on the side of the pinball, instead of centered under the game and pushed through the front legs like a real pinball dolly! Lifting tables (unless they are very expensive tables) come with stock small three inch all plastic or metal wheels and don't use any form of wheel ball/pin barring (small solid metal wheels will scratch or dent wood flooring and don't roll too well over thick carpet). Plastic wheels will not last long when moving the normal 350+ pound weight of a pinball (even over a smooth concrete floor or driveway). The removable dolly control handles make our Yellow Jacket pinball dolly easy to store under an operating pinball game. It can be carried in the same truck as the game, usually without reducing the number of games that can be put inside the truck bed. The Yellow Jacket Dolly is constructed to easily lift a 350 pound or more electromechanical or electronic pinball off the ground and move it wherever you want using large sized scratch free airless rubber lined wheels. The JY dolly uses a low center of gravity, enough dolly weight and the correct under game operating position to allow for a safe pinball machine move or dollied game to truck bed transfer. Custom wheel size and type - Additional costs per dolly & Shipping Cost Increases Wheel configuration example - installing custom 5 inch sized wheels. 4 or 3 inch wheels - no extra cost. However, 3 inch wheels will have to be custom ordered. The stock size is 4 inch wheels. 5 inch wheels - Additional $20 per dolly. Option will slightly increase total dolly weight. No effect on shipping costs. The customer must request the wheel type and size customizations when ordering a dolly and reimburse Pinball Medic for the additional parts, labor and shipping costs of a custom wheel configuration. Wheel Configuration Design Note: Our Coin Operated pinball dollies are normally constructed with two straight non-swivel wheels on the front of the dolly and two swivel wheels on the rear (rear=control lever end of dolly). Rear mounted swivel wheels allow the placing of a pinball machine between two other pinball games when maneuvering space is at a premium, provides dolly operator with complete control of the steering of the dolly and a very tight turning radius. A dolly with four swivel wheels is hard to move back and forth because swivel wheels tend to "lock-up" and stop turning with this kind of motion. This is the reason Pinball Medic uses two straight wheels at the front and two swivel wheels at the back of the dolly as the stock wheel configuration. Stock 4 inch diameter wheels (left wheel in photo) - Offer less total dolly weight then the 5 inch size wheels with only an inch decrease in Total Dolly Lift Height. Allows the dolly to easily fit under very low clearance pinball games (Safe Cracker pinball) or a wide body Gottlieb pinball with short front legs (Gottlieb's Roller Disco). 5 inch wheels (right wheel in photo) - This size of wheel provides easy dolly maneuvering over the thickest of shag carpeting and high ground clearance for clearing dolly obstacles. This wheel size is larger then the 'optional large wheel kits' of any industrial pinball dolly on the market today. A five inch wheeled dolly will still fit under a pinball game and it only increases the cost of a dolly by $20. 4 & 5 inch wheel Note: Four inch wheels have the SAME Wheel Load Capacity as five inch wheels. The Total Dolly Load Capacity is not affected by installing four or five inch wheels on a dolly. Four inch sized dolly wheels can improve the compatibility between the dolly and its operator as they decrease the total dolly weight without sacrificing the easy thick carpet roll through provided by the five inch wheels. 3 inch wheels - (not in wheel size photo) Offer the lightest dolly weight of any wheel option and will not increase the cost of the dolly. Note: Two inch wheels are the standard size wheel on other commercial quality pinball dollies. Lifting table versions can use plastic wheels. Neither of these wheel options are practical for long term use. Our dolly will lift much higher then the old 'Gurney' style of pinball dolly. It's also very stable when fully raised. The dolly has an automatically engaged mechanism to stop a legless pinball from sliding on a fully lowered dolly. Raising the game slightly to load a game on a truck will release this mechanism. Removable Lift Control Handle only protrudes five inches and will not interfere with the dolly operator's legs or walking ability. Protective wood at top of the two lifting rails - $15 per dolly. This option is highly recommended as it protects both the bottom of the pinball and the top of the dolly from scratches. The dolly can be shipped with the largest available wheels on a retail marketed pinball dolly (5 inch wheels and 8 inch front curb climbing wheels). Each wheel uses hardened roller bearings and hard rubber lined scratch free metal wheel hubs. Over a 1000 pounds of coin-op in one mid-sized truck. We have managed to fit (without damaging the games) three up righted pinball games (one a wide body pin), a full sized upright arcade game and a Yellow Jacket dolly inside the same mid-sized pick-up truck (a Mazda B4000 with a cab and regular bed length). 5 inch wheeled Yellow Jacket Dolly in a mid-sized Truck with room to spare. Try that with another dolly or platform lift! The compact size of this heavy duty pinball dolly with removable control handles really helps when moving a large game collection without the benefit of a large vehicle or trailer. It's also very easy to store under a game. We make moving pinball games easy! Pinball Medic can't count the number of trips our dolly has saved us because of its small footprint. This dolly has saved us from having to leave paid for games behind at auctions due to it's small size. All dolly control handles can be removed and reattached on a loaded dolly at anytime to avoid any unwanted handle to operator interaction. The lift handle (long handle) is used to effortlessly position the dolly under the game. The high lift height of this dolly makes it easy to either slide the pinball off the dolly or place it on its back to save space in a small truck bed. Both of these procedures can be done using only one person. The Yellow Jacket Dolly's basic dimensions. Dolly heights are measured using stock 4 inch wheels. The removable control handles are not included in the dolly's dimensions. Dolly Frame Dimensions - Length 31 3/4 inches Width 16 inches - Standard width of all commercial pinball dollies measured at main metal frame. Shipping crate included in weight. Pinball Medic can customize the wheel types and sizes installed on any dolly we manufacture. Dolly Wheel Replacement: All wheel frames are now securely bolted directly to the dolly's metal main frame for easy replacement. Replacement wheels can now be ordered. These newly constructed wheels can only be used on dollies manufactured after April, 2012. Older dollies can have their wheels replaced, but not their swivel or stationary wheel bodies as these were welded directly to the dolly frame. All wheel prices represent the standard wheel configuration of 2 straight wheels on the front and 2 swivel wheels on the back of the dolly. It is easy to totally replace the front mounted Curb Climbing Wheels. This only requires the removal to two long bolts. Pinball Medic installs only airless hard rubber lined wheels on any dolly we manufacture. Tire inflation is never required. 3 inch wheels - same price as the stock 4 inch wheels. Dolly and Pinball game protecting Hard Wood mounted to the top of a dolly. This option protects both the top of the dolly and the bottom of the pinball from scratches. The optional protective hard wood will cost $15 per dolly. The top wood option is highly recommended and will be installed on a dolly unless Pinball Medic is ordered not to install this option. Photo shows the discontinued eight inch wheel sized Yellow Jacket Pinball Dolly Under a game. This option is no longer being offered, but may return on other dolly models being made and tested by Pinball Medic. 8 inch wheels (shown in photo) - Only through extensive dolly modification (without sacrificing the dolly's low center of gravity and dolly stability) could this huge size of wheel be installed on a Yellow Jacket pinball dolly and still let it fit under all used and new pinball games. Using our 5 inch wheels, street curbs, highly offset door jams and even off-roading will not be a problem with this incredibly easy to use dolly customization. The two box shipping method and dolly assembly are mandatory with this wheel option. Even with huge eight inch front climbing wheels, a control handle equipped dolly can be stored completely under an operational game without taking up any extra home game room space. An up righted pinball is one that is sitting on its back end with its legs removed. It is usually stored this way to decrease the game's storage space footprint. The backbox is usually secured to the game's cabinet or can be removed and stored separately. Tilting Top - (Not available yet. It is still in development.). No prototype dolly has been built. This option will take awhile to develope and to test. The tilt option will not be available till late 2013. This dolly function enhancement allows a stored upright pinball to be placed on and taken off the dolly with ease (Game strapping is required). Tilting Top operation: An empty dolly frame is tilted upright on the Tilting Top design using a second removable lifting handle, just like a hand or refrigerator dolly. Unlike the dolly's removable control handles, the tilting handle cannot be removed while the dolly is in operation but will not interfere or obstruct the operator during normal dolly operations and can be removed after the tilting operation for easy dolly storage. The tilted dolly can be used to place an up righted pinball onto the top of the dolly without the need to physically pick up the game and set it down on a dolly. The dolly does all the work for you and can even place the pinball back down on the ground in the upright position with ease. The tilting top dolly option can be moved out of the way for normal dolly operation (fully loaded with a game) and can operate normally as a lifting pinball dolly after the Tilting Top operation has been completed. Game holding straps will never have to be adjusted even when the pinball is tilted, lifted or moved by the dolly. These photos show our pinball mover, a hand truck dolly, a Star Trek Next Generation (STNG) pinball and even a full sized upright video arcade game loaded in a tiny truck bed. NOTE of the Obvious: Remember to remove the hold down strap before sliding the pinball off the dolly. Also, never strap an arcade to another game or fail to pad the metal strapping mechanism to save the game's side art. This truck has a cab and a very short length bed and was still able to fit all these games and dollies inside. Pinball Medic will ship a dolly in two large boxes. We may no longer be able to ship a totally assembled dolly because of the shipping costs. A typical dolly with stock four inch wheels (weighing 91 pounds) using ground shipping. User assembly is quick and easy using the photographic and step by step assembly manual. Please indicate if you want the fully assembled dolly on the order form. We suggest using a trucking company for multiple disassembled or fully assembled dolly orders to the same business destination. Shipping can be terminal to terminal or for a little more in shipping charges door to door with bulk dolly shipping. Note: Not all cities have a truck shipping terminal for our customer's use. Due to weight and shipping distance variables for any given number of dollies, Pinball Medic can't approximate the cost of truck shipping, however, using a truck to ship multiple dollies will save considerably when compared to shipping each dolly by ground shipping. The "Yellow Jacket Pinball Dolly", "Deluxe Yellow Jacket" Air Hockey & Billiard Dolly and Lazy Lift Pinball Dolly are registered trade marks of the Pinball Medic Amusements company. Pinball Medic is the only manufacture of "Yellow Jacket" & "Lazy Lift" dolly products and holds the Patent rights to the "Yellow Jacket" Pinball Dolly, "Deluxe Yellow Jacket" Pool and Billiard table and Lazy Lift pinball dollies. The materials contained in this site are protected by copyright under the laws of the United States, including but not limited to Title 17 of the United States Code, the Berne Convention and all treaties and conventions pertaining to intellectual property rights to which the United States is a signatory. Contents of this site may not be reproduced in any manner whatsoever either in whole or in part without written permission of the copyright owner, authorized agents or representatives. Federal law provides severe civil and criminal penalties for the unauthorized reproduction, distribution, or exhibition of copyrighted materials.